Juris Bunkis: He is an absolutely wonderful facial ENT doc. He did his residency at Southwest University in Texas, in Dallas. Did his fellowship here at UC Irvine State here, and he's now Orange County's premier sinus and airway surgeon. I'm going to let him say a few words first. Alexis Furze: He's a great liar. Very, very kind words. So yeah, I'm going to go ahead and start. I'm going to be talking more about kind of the functional stuff. Namely, the three major things we see in our practice, which does also include aesthetic surgery then Dr. Bunkis will take over and talk about his experience with his aesthetic practice and his experience with aesthetic nasal surgery. Like I was saying earlier, we're having a little glitch with the video so I can't run my videos off of here of some of my sinus surgeries and such. So I'm going to run them off of this, but since we're kind of close hopefully all of you guys can see it. It's a small group, so if any of you guys want to see the video again after the talk I'm happy to play some of the videos for you. Okay. What I'm going to try to focus on is some of the newer stuff, some of the newer advancements in nasal and sinus surgery over the last half a decade or so. Couple new implants have come out. Couple of new devices to aid in minimally invasive sinus surgery available. We're going to highlight some ... very end of my talk. We'll just talk briefly about aesthetics and then hand it over to Dr. Bunkis to expand upon that. As far as my background goes, as Dr. Bunkis mentioned I got my head and neck EMT training back in Texas at UT Southwestern in Dallas. Then went on to do my facial plastic surgery fellowship here locally at UCI. I'm boarded with two fields, in both ENT and then I'm double board certified in patient plastics and reconstructive surgery. I'm also a fellow of the American College of Surgeons. The most common kind of complaints that patients come to me for at this point in my practice, and basically 95% of what I deal with in my practice, has to do with these three bullet points here. One is nasal obstruction and blockage in the nose. Patients that cannot breathe through their nose, looking for a potential alternative to fixing their nose and to get them breathing better. In my practice that's typically a surgical type case. I also see patients with chronic sinus infections, or sinus pressure. I typically see them when their disease is advanced enough that they require some type of intervention or surgery. But some of these patients just have one or two infections and we can treat them with medications and get them cured without necessarily intervening surgically. Then, obviously, the patients that are unhappy with their nasal appearance whether they've had surgery before, whether they've never had surgery and they're looking to have aesthetic rhinoplasty. I see a large number of these patients as well. A lot of patients actually have a combination. It's not often that, or it's very often actually that I'm doing all three. I'm relieving nasal obstruction in patients, taking care of their sinus problems which is what we did for Dr. Bunkis and then, not in his case but in other cases, at the same time we can perform aesthetic rhinoplasty if the patient so desires. In order to understand nasal obstruction and the sinuses and sinusitis, we have to understand the anatomy. So, just briefly I wanted to highlight that the inside of the nasal cavity is here, and the patient's sinuses are like cul-de-sacs that dump out into the nasal cavity. If there's any obstruction where these dump out into the nasal cavity that will cause potential sinusitis or fluid backlog in the sinuses. In addition, if there's any blockage in the nasal cavity such as a deviated septum or large turbinates this can actually function to block the outflow of the sinus contents and also lead to potential sinusitis. So, once you understand the anatomy in a cartoon you can kind of start now reading CT scans. This is basically a similar diagram of what you just saw but shown in black and white as a CT image. Now this patient on the left side has got normal nose anatomy. All this black is air, by the way. You want to have part of the that in the nose and in the sinuses. This patient has multiple abnormalities including sinuses that are full of junk, also has a septum right here that's pretty deviated. You see that going left to right. The septum should be straight up and down right there. We're not going to really go and delve into this but you can see how this patient has more obstruction in the nose and then obviously the sinus obstruction that this patient does not suffer from. So when it comes to chronic sinusitis the patients that I deal with most are the chronic sinus patients or the recurring acute. Patients that get infection after infection after infection. Those typically cannot be treated with medications alone. They need some type of surgical intervention. So, what do we do for these patients? Well, out the gate we want to make sure their immune system is working well. Make sure that they don't have history of allergy problems. Because if their immune system doesn't work well you're going to be subject to not just sinus infections but urinary tract infections, and lung infections, and everything else. We're not necessarily going to do surgery on you if we think that you're going to get infections regardless because of your immune system. In the management, we also get a CT scan. That was shown on the previous slide. Then this is more for when I'm giving this talk to my primary care physicians is that if these haven't checked out, or the CT sinus shows some chronic sinus issues they're going to want to refer to somebody like me that deals with nasal and sinus surgery. Previously, and still to this day, we perform what I term as traditional sinus surgery, which is also termed functional endoscopic sinus surgery. Where we go into the nose with cameras and we use multiple instruments to cut out pieces of the sinuses in order to open them up. We only do this in the more severe cases now. I'm going to talk in just a little while about how we've become more minimally invasive and what the kind of the latest advancements in sinus surgery has been. But there's still sometimes where we need to do larger more open surgery inside the nose. It's just like nowadays if you get your gallbladder taken out they take it out through three little punch holes in your abdomen as opposed to back in the day where they made a nice large incision on you and then took it out with their hands. We've kind of undergone the same revolution in sinus surgery. So we went from back in the day lifting people's lips and just punching holes in their skull to now going through the nose and minimally invasivley using a camera and small devices to just gently open the sinuses. The goals of sinus surgery is basically clear those cul-de-sacs that are getting obstructed. But there's a number of limitations with the old school type of surgery. The biggest one being the healing time, the bleeding and sometimes the pain associated. So what is new for our chronic sinusitis sufferers? Well, the minimally invasive surgery, the balloon sinuplasty which we actually perform in the office, as well as the operating room now. Then the drug alluding stents. There termed propel stents made by a company named Intersect. These have kind of helped us in treating patients in surgery to give them a longer post operative relief when it comes to sinus disease. These stents we place in just like they do stents in the heart, to keep things open. But at the same time they allude steroid medication that helps with patients chronic sinus symptoms. So this is the first video here, again I'm going to run it off of here and hopefully you can all see it. I'll actually turn the volume up too. Because some of these have audio. Sorry. Let me do this from this direction, and let's see here we go. What this video's going to show is the device that we use for the balloon sinuplasty now. I don't know if that's going to show up, but. So you can see the cul-de-sacs that we spoke about earlier. This one's got inflammation in it and we can use this device to gently thread a little tiny light wire, it's about a millimeter thick and it lights up the patients sinus once it's in. Once that's in there we'll thread in a balloon over top of that and use that balloon, you can see the balloon going in, and we'll inflate that balloon to pop open the sinus. You'll see that right now. Once that's done we deflate the balloon, remove the wire and then we can go back or at the same time sometimes put a catheter in there and flush out all that junk and get that sinus hopefully clean and back to what we would call baseline. So, previously we'd have to cut all these bones out to get big nice holes into the sinus. Again, we still do that but not nearly as much as we used to with the minimally invasive. Next slide is actually a video of a patient that we've done the balloon in. So this is showing one of my patients, hopefully, you can't identify her from that alone. Unless you know her nose and teeth really well. I couldn't even tell you her name at this point honestly. But, this is going to show you me going in with the camera and the balloon device. You'll see us dilating a sinus and kind of what that looks like. So there's the small sinus hole if everybody can see that? And then you're gonna watch us put the balloon in after getting the wire in there. Put the balloon in, now we'll inflate it. You'll see a little bit of blood, hopefully, it doesn't kinda gross you out it's only a couple drops. Remember, everything is magnified so it looks like a waterfall but it's two drops. Alright. And then the balloon comes back down, we remove it, suction out any of the blood and now you can see how large the hole is compared to previous. Now, I go in... a lot of times I'll do more than one dilation. I wanna give patients the largest possible hole that I can at the time of surgery, so I'll go in and sometimes do a couple different dilation's to get that hole as big as possible. Now, once this is done, and you can see, this is in real time, that only took all of about 30 seconds, a minute. We'll go right into the other side, do the same thing. Patient has the small ... this hole's a little bit bigger than the other side, but it's still relatively small and causing the patient's sinus symptoms. Or sinusitis symptoms. And so same thing, we're gonna go in, we're gonna inflate that balloon, we're gonna pop open that sinus opening, and then ... I don't know if I show the flushing on this slide, I don't think I do, but we'll go back in with a catheter and flush it out once the hole is nice and large. again, I'm doing a second dilation just for a little extra opening. Speaker 3: Does this last? Alexis Furze: This does. This is ... so I'm gonna show you on the projector is an example, is the actual pictures from the first side we did. Those are the still photographs and you can see. Number one, how big the hole is compared to the previous hole, right? It's ... and that, it looks almost 10 times as large. Now what you can't see as well is a little tiny bone spicule here, I don't know if you can see this, you can see it when the video's running live, but the little bones that make the sinuses tight are paper thin so what these balloons do is they break them and move them out of the way and then they heal out of the way. Yeah. This is designed to be permanent. It's also part of the reason I do multiple dilation's. I've yet, I think I've only had maybe two or three patients that have failed this procedure out of the hundreds we've done and ... or maybe thousands we've done at this point. Again, they failed for other reasons. Not because the bones didn't stay where they were. These patients had more severe sinus issues. But we believe that this is permanent because once those bones are pushed out of the way and they heal nice and open, the patient no longer has any trouble. So it is designed to be permanent. Speaker 4: What's that balloon made of? Alexis Furze: Sometimes, sometimes. Every once in a while we'll get a ballon that'll pop. I don't know the thickness of the balloon, the width of it is six to seven millimeters depending on what we wanna use, and every once in a while we'll have a balloon pop. We had one pop just last week in the office. It's no big deal, the companies replace them if they pop. Then they look at them and see why they popped. Yeah they'll go up to 12 atmospheres of pressure which is what we use to dilate. Typically as long as the spicules aren't that bad, those bones are paper thin they're not strong enough to pop the balloon. It does happen every once in a while. So, my next video is simply showing suctioning some mucus out of one of the patients sinuses. This is kind of gross but kind of interesting at the same time. You can almost feel relief for this patient. Small sinus hole there, and you can see the mucus that we're just sucking out of there. I show you this, just to show you the junk that get stuck in the sinus. It's really gross, but you can see once we suction that out the patient has a nice opening to that sinus. Okay. So, why do we do balloon sinuplasty? Again, everything in surgery is going to minimally invasive. For good reason, as technology develops we shouldn't have to cut patients as much, we shouldn't have to cause as much destruction in surgeries to fix certain problems. So, the nice thing about balloon sinuplasty however, is it's minimally invasive but, if we needed to do bigger sinus surgery if you failed this for instance or your sinus disease was just so extensive that we had to do the previous type of surgery. We don't burn any bridges. You sometimes burn bridges if you do it the other way if you do extensive sinus surgery you typically are not a candidate for a balloon. I have a number of patients that have their sinuses widely opened 10, 15 years ago, then they come to be and say "Hey can you do the balloon on me? I think my sinuses are acting up again." A, there's no reason to do the balloon cause their sinus openings are very large, but typically you can do it's a waste of time, because those patients are so open already. Also, we can use the balloon in conjunction with traditional sinus surgery. Which I do very often, and I actually did in Dr. Bunkis's case. I use the balloon to find the opening I'll dilate the opening so I have line of sight, and I can see exactly where the opening should be, although it's gonna be a little smaller than I would like. Then I go in there with a traditional instruments and then I take out the bone around that and make that opening bigger. So, it's quite often actually that we're using the ballon even when we're doing traditional sinus surgery. It's just that good a device. Also, we can do it in the office under local anesthesia. We typically will give a little bit of sedation to a patient, a little Valium before they come in. But, this is very, very well tolerated. I've had maybe two or three patients that while we're getting ready to do the surgery they're just like "Doc, I don't think I can do it." That's fine we let them recover, let them go home and then we just take them into the operating room and do it. But, fortunately for a lot of patients that can tolerate the procedure, it's cheaper for them and their insurance company doing it in the office. There's typically no need to do any nasal packing or any of the painful stuff they use to do with sinus surgery. Patients usually bounce back from this within a day. The next day they can be back up and running. I've had patients that are on flights the next day. So, it's not just the traditional sinus surgery, that keeps patients down for about a week or keeps them from going back to work sooner. There benefits, local anesthesia again, if you don't have general anesthesia you don't even have to worry about that night. You can drive your car, you can do all those things, you don't have to go home and go to sleep. Fast recovery, you're back up and running as soon as the next day. We do comfortable surroundings in our office, usually play a little music for the patients and get them comfortable. As opposed to the operating room where there's 15 people buzzing around you, the beeps going on in the background, which can be a little nerve wracking for some patients. Then we put them to sleep and they do just fine. High, high, high patient satisfaction, and then we talked about the cost savings for both you and your insurance company. That's why they like it. The other technology that I briefly mentioned earlier is these drug eluding stents. These typically we don't do with balloon cases, we don't put these stents. In rare cases, I will. I had a case last week of a patient who's a diver, and every time he dives he get bad pressure up here above his eyes. He had, had previous sinus surgery, but still openings weren't big enough there. So what we did for him was we balloon opened those sinuses and made them larger and we put two of these stents in each of the sinus openings, to give him the widest possible openings minimally invasivley. He did not want to go to surgery, and have a big surgery if he didn't have to. So, we attempt this first. If he fails this we'll then go to traditional surgery. So, let me show you a video of the actual stent. That's a picture, a computer generated image on the right side, and that's how big it is in the surgeons fingers. 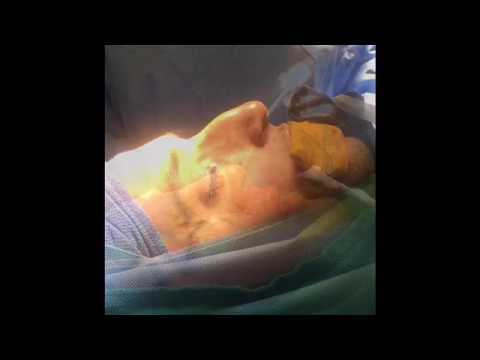 In this video... so this is an example of an traditional sinus surgery. Automated Video: [inaudible] After surgery, it's spring lined design props open the sinus helps maintain [inaudible] once in place the valve delivers an antiinflammatory medicine over 30 days. [inaudible] tissue growth, as the sinus heals. The product is designed to dissolve within 45 days. By holding the sinuses open [inaudible] sinus surgery [inaudible] that can provide relief from chronic sinus disease. Alexis Furze: Alright. So, heres another video showing a similar... to the previous video, but this will show you some more details. Automated 2: [crosstalk] antiinflammatory medication to the sinus tissue. The Propel implant is placed in a surgically opened ethmoid sinus. It's spine like design enables the physicians to prop open the sinus and maintain the surgical opening. Propel delivers an antiinflammatory medication called mometasone furoate, directly to the sinus lining as the implant dissolves. The Propel steroid releasing implant is clinically proven to maintain the opening created in the surgery. In randomized clinical studies Propel provided significant reductions in the frequencies in post surgical inflammation and scaring. For patients with chronic sinusitis this means reduce need for additional surgeries and medication. Surgery opens the sinus Propel keeps it open. Alexis Furze: So, that's it for the sinus portion of this talk. Now I'm gonna talk about nasal airway and nasal obstruction. Basically the latest development on that front as far as technology goes. So of you guys may be familiar with Breath Right strips or use them at night. Or some of you if you pull your cheeks like this you can feel that you can breathe better through your nose. This newest device is designed to essentially mimic that and hold it open without changing the external cosmetic appearance of the nose. While delivering strength to the sides of the nose what they're seeing is permanently. Although it's a absorbable implant the results... are after two years of data are showing that patients are having more permanent results with this implantable device. So let's talk about that for a little bit. To understand how this kind of device works and to understand nasal airway obstructive surgery you have to understand the anatomy inside of the nose. Again we saw some of this anatomy when I showed you the previous cartoon of the sinuses. We have what are called the turbinates in the nose, which are cylinders of tissue that add the the surface area. You need these, but if they're too big they could block the way. Then you've got the septum which is the wall that separates the left and right side of the nose. If that's crooked or you've got a bone spicule sticking out of it, it can obstruct your breathing. Now on top of all that you've got the cartilages on the outside of the nose. Here. Which these are the cartilages we're typically operating on. To make you nose look better postoperatively but, if these cartilages are weak in general they can collapse. Especially on inspiration, when you breathe in... in certain people you can watch their nose just shrink because the cartilages are collapsing. So, these Breathe Right strips are designed to go on that lateral surfaces, here, to reinforce it's like adding an extra 2X4 to your roof to prevent it from caving in. Now, this is what the implant looks like. It's almost... I don't know how to describe it, it's almost like a piece of fishing line or something of that sort. It gets placed along the sides of the nose. I typically don't place them in this trajectory. I'll typically place them out onto the cheeks a little bit, just because the skin gets a little thin here on the nose and sometimes very rarely you can feel them and I don't like that for my patients. I like them to not even know it's there except for the fact that it's working. There's a brief video, to show you it's use. Lets see...did that work? Automated 2: Nasal breathing provides more that 70% of airflow to the lungs. And it filters air, and helps us extract more oxygen from each breath. When patients are faced with obstructed breathing the side or lateral wall of the nose can collapse inward causing large changes in airflow, and quality of life consequences. Now, ENTs have a novel option to address this collapse, by supporting nasal upper and lower cartilage. A small canula is inserted just inside the nostril. When the canula tube reaches it's target a clear thin absorbable implant is injected into position. The canula is removed and the clear implant provides ongoing support. Preventing nasal wall collapse, and delivering relief from nasal obstruction symptoms. Alexis Furze: So, I've brought a model of a nose, if any of you guys wanna feel this thing. I've actually colored it black on this one so you can actually see it. But, you can see on this model that it doesn't change the contour of the nose, it doesn't add too the thickness to the skin. But at the same time you can feel the stiffness that it adds to the sides of the nose. This is why this implant has become very popular more recently. Previously we could do a surgery to kind of mimic this and I still have to do this surgery in certain cases. Not all hospitals and surgery centers will approve this implant cause it's not cheap. So, in those cases we still do the traditional surgery, but sometimes the traditional surgery can lead to a little cosmetic deformity and is not typically as predictable as this implant. So, I like to use this if at all possible for most patients. So, that's it actually for the technology of nasal airway surgery, or what's new in the last couple of years. Then the last thing we see in the practice is our aesthetic patients and our rhinoplasty patients. I'm looking at these patients and I can tell you that all of these patients except for one of them came in with nasal airway breathing complaints. So, these are patients that needed their airways fixed on the inside, but then also wanted a cosmetic benefit at the same time. We were able to provide that for both these patients. This guy here actually had very, very bad sinuses, some of the worst I've seen. In one of the worst septum's I'd ever seen. He got a little bit of a cosmetic benefit out of this surgery. The rest of them I don't believe had sinus surgery. I think they all had nasal airway surgery, except for this guy he had nasal airway surgery, sinus surgery, and then a little bit of a cosmetic upgrade. Now, these are all primary rhinoplasties, I don't know if Dr. Bunkis is gonna get into that but for patients who have never had nasal surgery before or nasal aesthetic surgery. We call that a primary case, that means nobody's touched the nose. Much easier surgery to do for those patients. The second group of patients are the revision rhinoplasty patients, we see a number of these patients. I see a lot of these patients mainly because they can't breath or they're having other trouble. These are basically the botched patients. Unfortunately in a lot of these patients you can only do so much for them, you can't make their nose absolutely perfect as if it were a primary surgery. But you can at least fix their nose to some degree, and get it to look operated on in certain circumstances. So, this patient had... this is probably one of the most difficult rhinoplasties that I've performed. The reason being the surgeon left a hole on the inside of the nose, the patient says she's having nasal bleeding from what we call septal perforation. When I opened her nose up she really had no support, and her entire nose collapsed on the table. So I had to reconstruct her almost from the ground up but, this is what her nose used to look like before she had, had any surgery. She actually didn't actually have a problem with that, the surgeon that went in was too aggressive with her, and twisted her nose and did some other things and she was stoked when her nose actually came out looking, definitely more natural. Not to mention she could breathe better, and she no longer had nasal bleeding problems. This patient couldn't breathe this was the older school rhinoplasty type of surgery where they really, really pinched the tip and the nostrils get shrunk. 15, 20 years ago surgeons would ask you "Do you wanna breathe through your nose, or do you want it to look small?" You had to pick one. These days it's not the case, rhinoplasty these days we should be able to reinforce the nose and maintain breathing while making it look better aesthetically. So we had to go back in and do a revision surgery on her. We made her nasal base look a little more equilateral. Less pinched, but more importantly you can see her nostrils are way more open now and she can actually breathe. That's really what she was looking for, in fact this was not considered a cosmetic job, her insurance paid for this it didn't come out of her pocket. At the same time she got a little cosmetic benefit. So, that's our reconstructive rhinoplasty population, which we take care of. I think I saw two or three consults come in just for that alone. So, that's our information I know I am operating on a couple of people that are here and work for us. For those of you that don't know us or our phone numbers or anything it's all here and we have cards and handouts for you guys if you want to contact the practice for any reason. Okay. And that's it. What questions can I answer? Speaker 3: If you had the real major sinus surgery as you called it... The old one where they go in... why won't the ballon work and what would you do? Alexis Furze: So it just depends. If you've had an adequate sinus surgery, if it was done correctly and there was no scar tissue or corrosive polyps, your sinuses should be opening and theoretically you shouldn't be able to get sinus infections. What happens a lot of the times though is if you had the sinus surgery previously or your surgeon did a quick job or wasn't that well trained in sinus surgery. He may have left a few sinuses behind or left one opening not too big... it depends. When we work you up and get your CT scan we can see what was done. If you come into the office in my practice typically a camera in the nose. We'll look around for those sinus openings and see what they look like, so what I see nine times out of ten, if a patient continues to have sinus issues it's because the sinuses weren't addressed aggressively enough at that time. Another reason I see issues with patients that have had bigger sinus surgeries, is sometimes they make the holes too big. So, the sinuses they function, and the tissue around the sinuses function, and part of that is protecting you don't wanna have this wide open cavity that you can get fungus and allergens in, that can then just set up shop. So, you do want to have somewhat of a barrier. So, you want your hole to be big enough to drain but, not too big where you can get too much gunk in there. Some patients I see have had too much tissue taken out. Those are very difficult patients because they'll continue to have sinus symptoms although there's not much you can do for them. You can't open them up anymore it just makes the problem worse. So it just depends, it's a case-by-case basis. Depending if they're in the first group that need a little more aggressive surgery, we can take them back to surgery and concentrate on one or two of the sinuses that need help. Audience Member: How many rhinoplasties versus nasal procedures do you do? Or would you say more than half the nasal procedures are also rhino. Alexis Furze: I would say, probably 90% of my rhinos are nasal airway surgeries at the same time. In my practice my patients and maybe it's because I am ENT trained, when somebody comes in for rhinoplasty consult... so, some patients come in and merely want a better looking nose. I get to talking to them and we take a look in their nose and we realize that there's some nasal airway obstruction as well. I think for that reason, the reason we see it so much, and the reason we pick up on it so quickly is a lot of those patients end up getting a portion of it being functional portion of that surgery. So, they really go hand-in-hand in my practice, but I can tell you almost everybody that gets a cosmetic rhinoplasty in my practice typically has some type of functional issue. It actually works well for the patients too, because at the same time their insurance will pick up part of the tab if there is something functionally wrong with them. I do a couple of cases here and there that are just purely cosmetic. But, most of them have a functional component. So it's a little vice versa. Any other questions? Perfect well, I'm gonna hand it over to the man of the hour here, and let him take over with his rhinoplasty experience. I'll move this guy over here so you guys can stare at it. Juris Bunkis: Thank you sir. Alexis Furze: I'm gonna hide in the back and heckle from [inaudible]. I'll be back out when he's done. Juris Bunkis: I'm so happy that I have Alexis with us today. He really, really is a fantastic airway and sinus surgeon. I couldn't believe the stuff that came out of mine after he was done. I had my surgery on a Friday and I iced on Saturday and Sunday, and I did face lifts and noses on Monday I was back at work. It really didn't take me long to recover but, my airway sure is better. Well, I'm the luckiest guy in the world. I work here, I have some of the greatest ladies working with me and they're all here this evening and the is Joe Colet, Tina, and this is our newest addition Crystal, right here that's starting with us in September. She's a Physicians Assistant, we're very, very pleased to have her with us. In our practice we do the full scope of aesthetic plastic surgery. I don't do a whole lot of reconstructive surgery anymore except for the occasional skin cancer. But, I'll go over my background a little bit, I went to medical school at The University of Toronto and it's a little scare but I graduated in 1974 from medical school. I'm double board certified as well, I went to Columbia University in New York and did my general surgery training, I'm board certified in general surgery. Then I went to Harvard in Boston and did my plastic surgery training. I came out to California in 1981 and taught plastic surgery in medicine in general at University California San Francisco. About 35 years ago I went into private practice and now my practice consists of mainly aesthetic surgery. Here at our practice we do all the aesthetic type procedures and we also have the skin care line. Which was developed my this lady, who happens to be my wife. Sometimes skin care along won't cut it, you have to do surgery. This lady is 79 years old she has an okay nose she can breathe well but, she has wrinkles everywhere, she's got droopy brows a lot of excess skin, loose neck. She is the gal who told me that she would never have considered aesthetic surgery, but she was a writer and she won an award and had to go to England to be handed this award by the Queen and she said I can't go looking like this. Came in and saw me, and she went about three months later and that's how she look and she was a pretty happy gal. But, today our focus is noses, and I will basically talk about my 38 years experience doing nasal surgeries since I finished my residency. Nasal surgery was started in the 1500s, when you really think about this, this is 300 to 400 hundred years before the onset of anesthesia. They did manage, maybe a little vino was involved, they did manage to take off some nasal humps and so forth. Obviously in those days they didn't do tiny, tiny, little foluses of the tip, and little bumps on the top. They did it on very severe people, who were very strong. The rhinoplasty techniques of today really started in the early 20th century by Dr. Joesph and then in 80's Jack Sheen here in LA published a textbook and numerous, numerous articles about it, and the knowledge about nasal surgery exploded. The guys listed at the bottom are the guys who today write the most about nasal surgery. Now, when you do rhinoplasties there are two main techniques that are used for aesthetic surgery that are called open and closed rhinoplasties. This is drastically open but, this guy was dead I'm just showing you the anatomy. When I was in medical school, and when I was a resident in plastic surgery, cadavers were very readily available. If you wanted to learn how to dissect the hand you asked the curator at the anatomy lab can you have a couple of hands. They ask you how many you want six, four, and you take them and you dissect the tendons you really learn how things work. With noses they're very, very hard to teach because the incisions are traditionally are just place inside the nose and they're only about this long, and you have a head light on and you're trying to see in the hole. You're trying to see the anatomy in there. When you put your headlight on and you look in that hole you can't show anybody else. When I'm doing a facelift I can have three people sitting beside me watching what I'm doing and they can learn by watching me. You can't learn by watching somebody do a rhinoplasty cause you can't see in the hole. In those days I use to go get cadaver, after cadaver, after cadaver, take the skin off until I really, really understood how the cartilage was overlapped and what they did. Then we take some with the skin on and make some little incisions and practice until I got it right, until they all turned out good. Then I started doing them on people. Today cadavers are not very readily available, and to make it easier for people who don't have that background with the cadavers they've invented this technique where they make a incision across the base of the nose and they peel all the skin off. When you do that you can see the entire cartilage, it's like this, obviously not this well but you can see it very very well. Two people can be watching at the same time. That's how the younger generations of surgeons are taught to do noses. The older generation of surgeons still tend to do most of theirs with just the inside incisions. There still is a high dissatisfaction rate, with rhinoplasty surgery maybe 5 to 7% of people a year later, or two years later come back and they have a little touch up and that's not uncommon at all. These are some of the reasons why it happens. This is a very, very important one because it's a difficult procedure to learn, it's a difficult procedure to teach somebody. These are the thing that people talk about, too much was done. Alexis mentioned that years ago everybody scooped nose with a pinched tip, and it looked like a cookie cutter. They all came out looking the same didn't matter what you went in looking like, that's how you came out. I have never done that, I try to individualize the result to the patients other facial features and their desires. But I won't overdo anything. If somebody asks me for a big scooped nose and a tip that's very high and had a big bump to start with. They would look so bizarre, so ridiculous that I just try to explain to them there's a more natural way of doing things. Sometimes you end up with irregularities on dorsum you just can't help that. You never leave the operating table with irregularities. You feel it, you can see that sometimes as the bones are growing and the cartilage is growing you'll have a little bump form. You gotta go back and take it out, but that's just part of doing noses. You have to be prepared for that and this is not a procedure that every ENT or plastic surgeon should do. You should go to someone who really does a lot of noses. I wouldn't go to somebody who does one a month or one a year. This gal had two open rhinoplasties and came to see me. You can see how her tip has collapsed, her tip is completely over rotated. That doesn't have anything natural to me and it's very, very difficult to correct in something like that. Our goals are to meet the patients expectations and to match their facial features. If you start with a big bump in your nose, you're gonna look fine with a nice straight nose. You don't need some kind of a scope, you have to make it match the face. From here on in no more gory pictures I can show you a bunch of examples. This guy was my anesthesiologist back in the day. He was only 37 years old but I took a little piece of skin off his upper lids, he was weight lifter and he said when he was in the gym the sweat always ran into his eyes. I straightened out his nose, I thinned it a little bit, he didn't have much of a chin. I put a little chin implant in him. He had kind of a goofy neck I tightened that up for him. If you look at him if he comes to your door you still recognize him. "Hi Andy, how are you doing?" It's not like who are you? That's what you don't want. Here he is from the side, you can see the improvements a little bit more dramatically. You can see the little bumps gone, what you want ideally is to have this as the high point of your nose. You don't want the high point up here somewhere, you want it down here. His tip plunged down a little bit, I put a little graft from here to here at the bottom of his nose to support his tip a little bit. Thinned it straightened it, put a little chin implant in here, stuck his neck out a little bit and he looks good. It's not over done, took me about an hour to do that. Heres one of my nurses in the past, she's got a very bulky tip. We thinned her tip a little bit, took a little bump down. Still looks like Annie, doesn't look like somebody you've never seen before. If you look at her from the side, this is now the high point of her nose instead of this. Her chin is fine didn't have to do anything there. She didn't have any fat in her neck, we didn't have to do anything there, just basically thinned her tip and we brought down the tip. This gal was a singer, you can look at her she's got a little bulky tip we thinned it a little bit. A little bit of a bump brought that down. Very happy lady. This was an 18 year old kid who just finished high school, got a little present from her parents for graduation. You can see her tip is much more defined here than it is here. If you look here this is her smiling, how she has a pompanate that plunges down here. She's got a straight nose and she looks a lot better. I'll show you a couple of ethnic noses. Same kind of thing. I put this one in to remember to discuss age. We use to say boys shouldn't get their noses done before they're 16 and girls go down to 14. Cause that's when... when I was a resident that's when most people hit puberty and start to mature and so forth. Today kids grow a lot quicker and I'll show you the side view. He's got a pretty big nose on him and his nose is fully grown, he's only 14 years old. So I don't look at the absolute age I look at how adult looking that persons nose is and if it's adult looking at 14 I'll do his nose. If he comes in at 14 and has a little fullness in his tip, and doesn't look like he has an adult nose yet, I'll ask him to come back in a year or two. You can see this kid going through high school and so forth, he'd be teased. Here his nose looks a little bit more proportionate. A couple of others. You can see when people have these I call them deformities if you will. They feel insecure and this is what we are trying to alleviate, we never tell people they should do their nose. People come in and tell us that their noses bother them and we tell them the options. This gal was down three time before she saw me, and you can see how crooked her nose is. She still had a pretty nasty bump on her nose and I straightened it, thinned it and raised her tip up just a little bit. You can see her in the side view here, very happy gal. Not always do we take things away sometimes we add to noses. This fellow came in and didn't like the fact that his nose was very, very scooped. In him I put in a little cartilage graft in the top. You can see how that fills that out. These are the things that we can use for a grafts. First of all the cartilage I'm gonna be taking out of the nose or the septum if I'm doing that. That's my first choice of what to use, cause I don't have to go get it anywhere else. But, if they don't have that the ear is the second most common one that we use. A rib very, very rarely you use a rib. If there's a massive collapse of the nose, if you need a lot of support. Today I inject hyaluronic acid which is Juvederm, Hylunia, Restylane, one of those things. If somebody has a minor nasal deformity and I'll show you some examples of that. Some of these other implants I just haven't used for years. Silicone is still used occasionally and I'll show you some examples. This is what a rib cartilage looks like when it comes out. You cave it to look like a nasal tip, you put a little pin in it, you put it in. This guy had multiple, multiple, multiple nasal fractures and his nose just collapsed. If you look at him from the side, the bone just collapsed and this is reconstructed with some ribs. This is where we take cartilage from most often if we don't have enough from the nose. This is from the bowl of the ear, you can take that cartilage out, you can shape it and use it in the nose and that lining that's left in the ear the cartilage lining will grow another cartilage. So a year later it doesn't feel like a flap of skin it feels like another cartilage in there. So it will regrow. This is the one that I used an ear cartilage graft, she actually came in for a facelift and was sitting talking to me and I was looking at her history form and it doesn't say anything about having her nose done before. I just asked "Have you ever had anything done to your nose?" It's kind of obvious to me that there was. She started to cry and she told me how she'd done it 20 years earlier and it's always bothered her a lot. I said why didn't you mention it to me I can fix it at the same time. I took a little bit of cartilage from her ear I redid her tip and her face was fine but she loved her nose more than anything else. This is another example of someone with a very, very weak ridge. We put these implants in through the inside of the mouth and it's an L-shaped graft like this. If you just put a strut in like this there's a lot of pressure on the skin where the end of the strut is and I've seen them erode through the skin. But, if you go in through the mouth and put that L-shaped graft in that doesn't happen. And heres that gal from the front. This is one of these gals that had her nose done, see how it's crooked? I added a little Restylane in here, has a little bit of a divot here put a little bit of Restylane in there and you can see that her nose looks a lot better and that's 30 seconds in the office with a needle. Our goal is happy patients, we do everything we can to meet our patients expectations. Our next event will be September. We don't hold them in July or August and Crystal will be speaking at that one, and the topic will be wrinkle spots and hair. You guys are all welcome to come to that event in September. Thank you. Does anybody have any questions? Audience Member: I have a question. Do you ever take the fascia? Juris Bunkis: Do I take what? Audience Member: Fascia, right from here. Juris Bunkis: Sometimes. Sometimes we take fascia we put nice cartilage in it and that'll make a very nice dorsal graft. Juris Bunkis: I can't cover it all. Any other questions? Speaker 3: What's the typical recovery for [inaudible]? Juris Bunkis: About a week, because most people have cast on their nose for six days. I say 95% of the time when the cast comes off there aren't any bruises, or if there are you can cover them with light makeup. Every once in a while, once a year you'll get somebody doosy of a shiner that they might have it for three weeks. But that's very, very rare. Usually people take a week off. Well, thank you for coming. Try and finish this food and wine. Otherwise, it will turn into my dinner, and we'll be around if anybody has any questions.